And I must declare that Taylor Jenkins Reid is simply AWESOME!!!! I dare say this one was as good (or at least ALMOST as good) as “After I Do“. As I was saying… this one is at least as good (or almost as good) as “After I Do”. Definitely as poignantly written. I know he’s okay. I’m sure of it. I just need this to be over. I just want to see him with a small scrape and be told he’s fine to go home. Let’s go home, Ben. I’ve learned my lesson to never let you do such a stupid favor for me again. I’ve learned my lesson; let’s go home. “Ben!” I shout into the nighttime air. It’s so cold. How did it get so cold? He is just doing his job. Everyone here is just doing their job. What a bunch of a$$holes. Definitely as unique, heart-wrenching and thought provoking. Definitely had that incredibly realistic quality that had me feeling as if I was living and breathing her life, right along with her. I stand in front of the mirror and I look at myself. My face is red and blotchy. My eyes are bloodshot. I look at my face and I think that I had someone who loved this face. And now he’s gone. And now no one loves my face anymore. I was just… moved beyond belief, stunned into silence as big fat tears plopped off my cheeks, soaking my pajama top. And then I backed up, and re-read that last chapter again. And sobbed some more. Yep. Sob-inducing, I think I cried during at least 4 different parts. And not just a few tears either. Had to put down the book, hug my pillow and cry into it. I can’t stop crying and I don’t know if I ever will. I feel the ring in my hand, my palm sweating around it. My fist is so tight that my fingers ache. I let my muscles go, falling into her. I can hear myself blubbering. I am wailing loudly; the noises coming out of me feel like blisters. Oh that killed me. In fact, I’m writing this review through a red nose, burny-puffy eyes, and a sore throat. Who knew crying actually hurts throats? *sigh*. Such heart-wrenching, moving scenes, such incredible depth, and yet so down-to-earth in every way. So REAL. So us. So perfect! And yes, this one’s pretty pricey, too (just like “After I Do”), but OH SO worth it. Cheryl: Just read the blurb for her other book Forever, Interrupted- now that one I’m ascared of big time!! You’re crazy!!! Don’t think Amy’s manatee can even help with that one. <— side note: *giggle* Yeah… Oooof! It was an emotional one! Sadie: I have forever interrupted and am ready to start Megan, Erin and also Cori and Julie and Billie!! Megan: Great! We can all bawl together. Because I have a feeling it’s going to break my cold dark heart. Sally, forever interrupted is her debut novel. It’s a standalone and it’s going to be a movie starring Dakota Johnson. Erin: I’m a bit scared of Forever, Interrupted. It’s gonna hurt. Megan: You can do it, Erin. That’s what wine and chocolate is for. Erin: Lol! I’ll need more wine then chocolate. Sadie: Kira, I only just started and I’m already feeling it! Maryse’s Book Blog: So far so great!!! Maryse’s Book Blog: 67% just squeeeezed my heart. Maryse’s Book Blog: Finished!! Oh this one was just as good. Different, but no less poignant and powerful. Right to the very last line. Sadie: Did you finish?!! Gah! I agree – halfway through I’m loving it just as much. Sadie: I blame Taylor Reid for not being able to concentrate at work today! LOL I love it but I don’t want it to end. A sign of a good book. Well, almost perfect. Pretty darn close. I’m thinking 4.5 to 5 stars (easily!!) and I’m pretty sure I would have totally 5-starred this one had I not read After I Do, first (which I 5-star plussed), cause that one, to me, was simply phenomenal. I could barely put it down, and it had all of that “romantic angst” and real-life drama that kept me reading late into the night, and loving every last line. Forever, Interrupted gave me mostly all of that too, minus the extreme-inability to put it down. Mind you, I started it last night and finished it today (so it was mostly a non-stop read, for me) but I was able to set it down, go to sleep and “function” in between chapters. Perhaps it was the very heeeeavy subject matter (causing me to need breaks), or just the fact that I sort of… knew how this story was going to go, because it “starts” at the end. <— I’ll tell you about that, in a minute. And perhaps because of that, I didn’t feel as much of an urgency to get to the “answer”, but let me tell you, it was AWESOME, even if I wasn’t devouring it as quickly as I did “Before I Do”. After all, these are both incredibly touching, and at times, agonizing love stories, but they take a completely different storyline progression. It’s about a beautiful whirlwind romance, and an unthinkable loss. Two people that meet in a pizza shop one night, and can’t keep their eyes off each other. They banter, they flirt, and they can barely say goodbye. Within days, they are already dating, and within months, they are head-over-heels in love. And they elope. Their love is just tooooo much (and sooooo fun to experience, with them). So where’s the angst? It’s the way this book STARTS!!!! Because just six months into their incredible love affair, and just days into their married-couple bliss, Ben is killed in an accident. My mind flashes back to the Fruity Pebbles all over the road, and I know they will be there when I get home. I know that no one will have cleaned the, up because no one could possibly know how horrifying they would be to look at again. Then I think of what a stupid reason that is for Ben to die. He died over Fruity Pebbles. It would be funny if it wasn’t so… It will never be funny. Even the fact that I lost my husband because I had a craving for a children’s cereal based on the Flintstones cartoon. I hate myself for this. That’s who I hate the most. And Elsie’s wedded bliss…. her perfect-love, perfect-life comes crashing to the ground. An absolute downward spiral as she tries to navigate life living without the other half of her heart. I rarely cry in public anymore. I’ve become a person about which people say, “She’s really bounced back quite nicely.” I am lying to them. I have not bounced back nicely. I’ve just learned to impersonate the living. Being forced to let go of the perfect “Ben and Elsie” future she had been dreaming about. Coming to terms with his mother… that didn’t even know she existed. Amazing. And it’s not all just “downward spiral” and emotional pain and potential healing. Because the author strategically, ingeniously weaves us in and out of her past life, and her present life. We get to live the love story. The “meet-cute”. The infatuation. The jealous-fits, and the lovers-spats. The big declarations, and the silly-sweet moments. It’s all there for us to fall in love with, and break over, with her. And her present. Moments of utter anguish and darkness, and moments of light. And hope. Yep. INTENSE. And all that to say, this one was pretty much just as awesome, but that last chapter? TOTALLY cinched it from a 4-starish read to a 5-star. What a genius way to end this story. My heart!!!! I know some of you might think… yeah but, I can already see where this story is “going”. I mean, after all, it starts at the end, right? <— Well, yes, and at times, I thought so, too, (which might be why I didn’t devour this one in one-shot). BUT!!! You MUST experience the love, the devastation and her life (her thoughts, her memories, her hopes, her despair, her potential healing), to understand my emotional attachment to this one. This author. What. A. FIND!!!! She is officially 100% in my top favorites, and I will auto-buy anything coming from her. I’d almost say… her writing, her storytelling is reminiscent (to me, at least) to Tiffany DeBartolo’s work. *nods* Yep. THAT good! No. Not good. Breathtaking! I have a whole new reading world that just opened up to me (so many awesome “like this one” suggestions have suddenly come my way), and I can’t wait to dive in! I’m curious how your next read will go. You sort of did a mini glom, I love a good gloom, and I think it can sometimes be hard to move on after being immersed in an author’s style or world they created. Grr auto correct. A good glom. Nothing gloomy about a good read. I’m 1-clicking this one now regardless of price! I agree with you that I will be reading anything this author puts out……I haven’t had these intense feelings in so long! After I Do was just amazing and I will be recommending it to everyone! Maryse, please read Coming Home next! I beg you! It’s different from what we’ve just read and I know you will love it! And it’s on your current TBR list so you would make your Book Dom very proud! Lol! Okay!! Coming Home is next! Absolutely. Jean if you loved the books I’ve just loved, and tell me I should read Coming Home… how can i resist? Yay! Hope you love it as much as I did! Looking forward to your review! Coming Home = Excellent Choice. 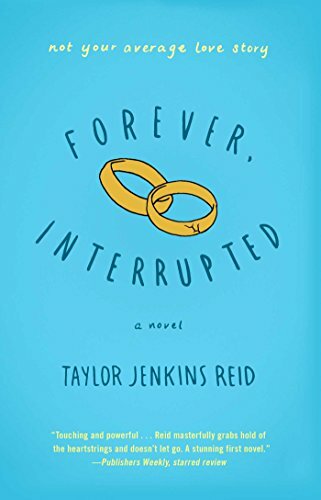 I finished Forever Interrupted and I ABSOLUTELY LOVED IT. *shouts from rooftops* Everyone should read it. YAY!!!! and YAY!!!! I’m on it, Sadie! Oh here I go again!!! I bought After I Do yesterday…your review helped convince me that I had to have it!!!! Now I’m grabbing this one!!! Oh BTW Coming Home…simply amazing!!! One of my favorite! Im half way through this book and I cant put it down! I wish this author had more books out becasue I am loving her style too. I already read Coming Home so I’m at a loss of what to read after this one. Such a great character driven writer. Do yo know how many books are named Coming Home? Who is the author? Did I miss that? I might just jump on the train and re read it too. It was good! Oh for crying out loud. You’re totally KILLING my book budget this week. At least this one is only 3.99. Thank you for clarifying the author – and I see the link in your post now. ONWARD! I know I’m late to this game but I just finished reading this book and im still crying. Hah I haven’t cried this hard while reading a book in a while. Maybe Someday did tear me up but this book….soon many tissues and soon many tears. 5 stars!